Chase Community Giving, a philanthropic program of the JPMorgan Chase Company is back this fall for its latest round of charitable giving. Since its debut in 2009, the popular campaign on Facebook has awarded $20 million in grants to more than 500 deserving non-profits across the country. This time around, Chase will give away $5 million in grants to organizations with operating expenses under $10 million, and several of Drum Corps International's World and Open Class corps are among the organizations eligible to receive funding. Voting will take place on Facebook and is open to registered users who have the Chase Community Giving app enabled on their profile. Everyone will automatically get 2 votes to use on Facebook. You can't use them both on the same charity, but there will be thousands of charities to pick from, so you shouldn't have a problem searching for 2 great organizations to support. Keeping with the spirit of giving, you'll have an opportunity to earn an extra vote. Just share a link from the Chase Community Giving app to your timeline. If one of your friends links back to the Chase Community Giving app and casts a vote of their own, voila! You'll earn an extra vote! You can use your extra vote on one of the 2 charities you already voted for, or a new charity—it's up to you! Also as a new feature, Chase customers will have access to two additional votes to use as they wish by logging into their accounts at Chase.com/ChaseGiving. 196 charity organizations have been pre-approved for this voting period that will begin Thursday, Sept. 6 and run until Wednesday, Sept. 19. The charity group receiving the most votes will be eligible for a $250,000 prize with other grants in amounts of $100,000, $50,000, $20,000 and $10,000 available to the runners-up. A number of Drum Corps International's World and Open Class corps are eligible and participating in this round of the Chase Community Giving campaign, as well as several all-age and alumni organizations affiliated with Drum Corps Associates. 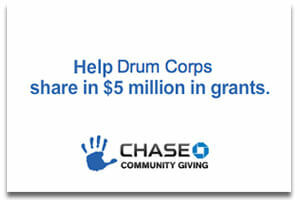 Thanks to the dedicated support of thousands of drum corps fans and arts advocates around the world, Drum Corps International, its corps and partner organizations have benefited from Chase Community Giving, earning more than a million dollars to support their ongoing operations. Representatives from Chase were at the 2012 DCI Southwestern Championship in San Antonio on July 21, to recognize the 27 DCI groups and affiliate organizations that have received funding over the last three years.